Prime Minister Benjamin Netanyahuhe said he would favorably consider a national referendum before finalizing any agreement with the Palestinians during a tour of the Gaza vicinity communities Tuesday. 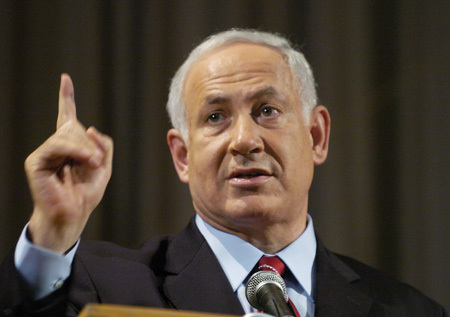 The prime minister, who also visited Ashkelon, warned Hamas against firing at Israeli communities. “Our prime commitment is security, and I suggest that Hamas and the other organizations refrain from testing our resolve to respond to the fire,” he said, arguing that the equation he presented on the matter prompted a reduction in the number of rocket attacks. Netanyahu also stressed his unwavering commitment to the residents of Ashkelon who continue to live under the missile threat. Meanwhile, the PM avoided an answer about the settlement construction freeze and whether it would be extended, saying: “Ask me again on Monday.” He also refused to respond to a question about whether Jonathan Pollard’s release was conditioned upon extending the freeze. Ashkelon Mayor Benny Vaknin thanked Netanyahu for his support but also reminded him of the recent rocket attacks. “Since Operation Cast Lead four Grad missiles have landed in the city, including inside a school,” he said. Qassam attacks against Israel continued in the past week. On Monday, a Qassam rocket landed in the Eshkol Regional Council and last Thursday nine mortar shells and rockets were fired at Israel. The IDF responded by attacking weapons caches in the Gaza Strip. Ships said to be in Cypriot waters; activist: We’re unarmed. Technical problems delayed the Gaza protest flotilla for ten minutes on Sunday evening as it continued to make its way to Israeli waters, but the organizers aboard the ships claimed it had resumed its voyage. The Israeli Navy, monitoring the ships, reported there was “hardly any movement” among the group. An activist of the Turkish Humanitarian Relief Foundation (IHH), which is involved in the campaign, said in an interview with Army Radio that the ships were on the open sea, still within the territorial waters of Cyprus. The IHH was previously blamed for channeling funds to a global Jihadist organization, a matter the activist refused to comment on. According to a Foreign Ministry press release, participants on the flotilla were recorded shouting “Khaybar Khaybar ya yahud, Jaish Muhammad saya’ud,” which means “Jews, remember Khyabar, the army of Mohammed is returning.” This cry relates to an event in the seventh century when Muslims massacred and expelled Jews from the town of Khaybar, in modern-day Saudi Arabia. The organizers of the protest flotilla said the ships were set to arrive in Israeli waters on Monday. The flotilla was originally slated to arrive in Gaza on Saturday but faced several delays because of technical difficulties. While eight ships were initially scheduled to sail to Gaza, in the end a total of five ships were reported to be on their way after three suffered technical malfunctions. One of the highest profile figures on the ships is Balad MK Haneen Zoabi, who said she was proud to do her part to end what she called a siege on Gaza. Right-wing MKs called for Zoabi’s arrest and ouster from the Knesset. “Zoabi is working together with Israel’s enemies to encourage terrorism and harm Israel’s image internationally, and these acts constitute treason,” Likud MK Danny Danon wrote to Attorney-General Yehuda Weinstein in his request for him to order Zoabi’s arrest upon her arrival in Israel. The navy is prepared to stop the ships before they reach Gaza and has put most of its forces on operational standby since Friday. The ships will receive a number of warnings as they begin to approach the Gaza Strip, starting from a distance of about 65 kilometers. If the ships are commandeered, they will be sailed to the Ashdod Port, where the government has set up tents to hold the activists. The activists will be taken to the tents for identification and medical attention, and asked to leave the country voluntarily. If they refuse, they will be arrested and transferred to the custody of the Prisons Service and the Interior Ministry.